I received an early copy of this book and reviewed. Receiving an early copy did not alter my review or opinion. Hope is sick. She has Cystic Fibrosis. Her mother keeps her sheltered. Praying she can keep her safe so she'll live that much longer. But Hope knows her time is limited and really would like to live her life to it's fullest. One day a letter changes all that. The Society dares her to do things she has never done before. All in the name of winning money, which she and her mother so desperately need to afford her care. I enjoyed Hope's character. She's down to earth and comes across as your typical teen who really just wants to live a normal life, yet there's nothing normal about her. Her daily routine, her medications, her treatments, change that. But that doesn't stop her from wanting things other teens want. And you feel that throughout the book. The plot is interesting. I will say I found some holes. Especially in the romance area. There wasn't enough build up for me or tension. I like there to be something I can latch onto and need from the characters and I just didn't find that with romance. But the author did a fairly good job with the mystery part of the story. I really wasn't sure who was behind the Society until the end of the book. The other characters were a nice touch. I liked Jenny, Hopes sister, she was the typical nosey sister who wanted to know what was going on. You could tell Hope cared for her. As for the other girls, I was happy to find Hope gaining a group of friends in them. I liked how she clashed with Farrah but didn't back down from her. How she found a friend in Lyla. I haven't seen Pretty Little Liars but this book has been compared to that many times. For me, I definitely felt the vibe of Lauren Oliver's Panic and just a bit of the relationships in Before I Fall (though not the plot line at all). Fans of her books will more than likely enjoy this book. 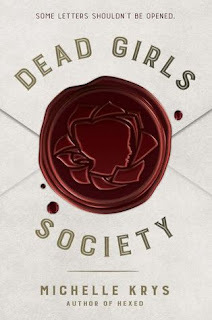 I'm the author of the YA novels HEXED and CHARMED, plus the upcoming DEAD GIRLS SOCIETY (Nov 8, 2016), all from Delacorte Press/Random House Children's Books. I'm repped by Adriann Ranta of Foundry Literary + Media. Visit me at michellekrys.com or follow @MichelleKrys on Twitter, @michellekrysbooks on Instagram, or mkrysbooks on Snapchat.